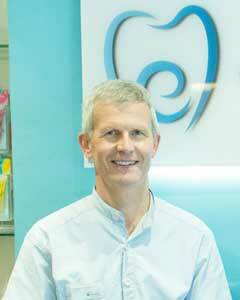 Andrew Browne qualified as a dentist from the University of Sheffield in 1986 . He worked in general practice in the UK and then spent 7 years in Australia in a variety of roles where he also took a Graduate Diploma in Professional Management. After returning to the UK he gained a Masters degree in Prosthodontics (complex restorative dentistry) from Manchester University in 1998. He became a partner at Evesham Place in 2002 and has since become the Clinical Director. He is married with 2 daughters at school in Stratford. Outside a busy professional life he enjoys travel and the outdoors. Katharine qualified in 2002 from the University Wales College of Medicine. After 5 years as a Royal Navy Dentist, delivering dental care to Royal Navy personnel onboard ships around the world, Katharine moved to general practice. 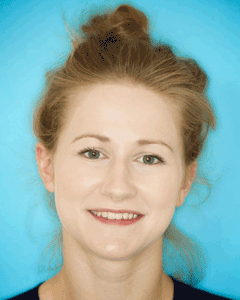 Katharine has obtained membership to the Faculty of General Dental Practitioners (MFGDP), a Diploma in Postgraduate Dental Studies (DPDS) and completed three years of certificate courses in Restorative and Cosmetic Dentistry. 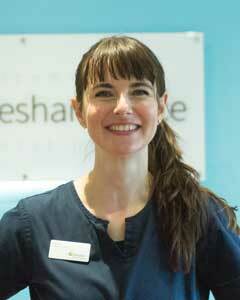 She also runs and teaches on courses for newly qualified dentists. 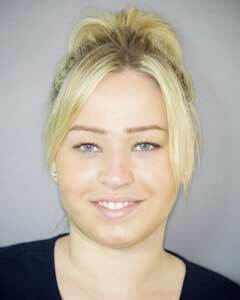 Katharine is married with three young children and enjoys fitness, cricket and cooking. Stephen qualified from Queen's University Belfast in 2008. After completing his Vocational Training Stephen spent 2 years working as a Senior House Office and Speciality Doctor in Oral Surgery. During this time he obtained his Membership of the Faculty of Dental Surgeons (MFDS) from the Royal College of Surgeons in Edinburgh, winning the John Smith medal for the highest mark in the examination. After time in private practice in Australia and Singapore, Stephen worked as a lecturer in the oral surgery department in Trinity College, Dublin. During this time he published a number of articles in peer-reviewed journals. Stephen has a special interest in dental implants, oral surgery and sedation. He has recently embarked upon a postgraduate Diploma in implantology dentists. Outside dentistry he enjoys travel with his wife, keeping fit and playing guitar. Bilal joined the practice in 2017. He qualified from The University of Birmingham in 2013. Since then he completed further training in Worcestershire and at Wythenshawe Hospital in Manchester in Oral & Maxillofacial Surgery. Gained two post-graduate qualifications; from The Royal College of Physicians and Surgeons (Glasgow) (2015), and The University of Bristol (2017). 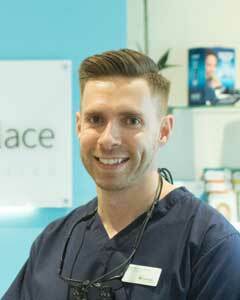 He enjoys all aspect of dentistry and building strong relationships with patients, ensuring their needs, expectations and care are met. Outside of work he enjoys travelling the world, experiencing and embracing other cultures. He also currently learning to speak Spanish. 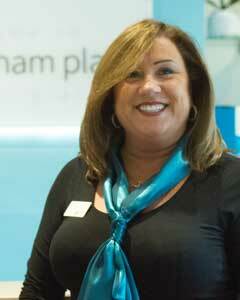 Alison joined Evesham Place Dental Practice 3 years ago. Her background is Pharmacy and General Practice Management. She lives locally, enjoys walking and playing golf. 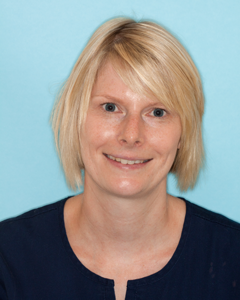 Paula has worked at the practice 15 years and enjoys the rapport and friendship she has built with not just colleagues but patients as well. 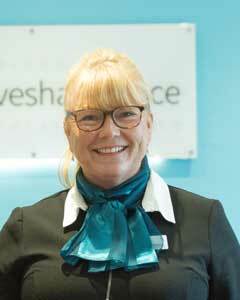 Mandy has worked with the friendly team at Evesham Place for six years. She lives locally. She has learned to enjoy keeping fit to compensate for her love of baking! 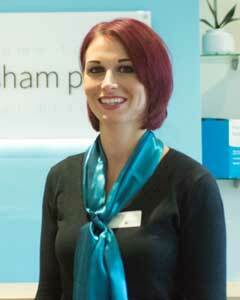 Clair joined Evesham Place Dental Practice in 1998 at age of 18. 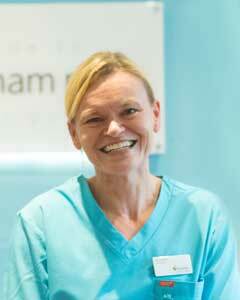 Working predominately as a dental nurse but in the later years has moved to the reception team, and thoroughly enjoys it. Clair has two daughters, aged 9 and 6. 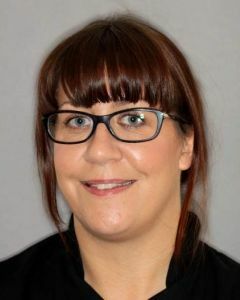 Ellie joined the practice in February 2018 and really enjoys working with such a dedicated and friendly team. 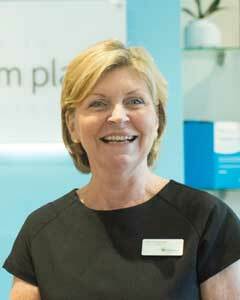 Elizabeth joined the Evesham Place Dental Team 21 years ago . She enjoys all aspects of her role as Dentists Hygienist. She also plays taxi service to her two teenage boys so keeping fit is a must. Lorraine qualified in 1980 and joined the practice in 1998. 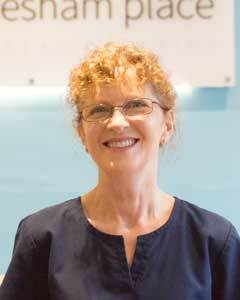 She has devoted much of her life to improving people’s oral health. She has 3 grown up daughters and lives at home with her husband and 2 dogs and 2 cats. Her hobbies include going to far too many live concerts! Isobel qualified in 2016 from the University of Birmingham gaining both Honours & Clinical distinction with her degree. Her role as a dental therapist involves educating patients on how to improve their oral hygiene and gum health. She can also carry out fillings on both adults and children, plus perform extractions of deciduous (baby) teeth. Isobel enjoys spending her weekends playing hockey and socialising with her friends and family. Julian qualified in 1991 from Matthew Boulton Technical College with a BTEC National Diploma in Dental Technology after completing 5 years of training in dental laboratories providing high quality technical dentistry. With over 25 years of experience as a qualified dental technician, Julian has become a respected technologist to some of the UK leading dentists. 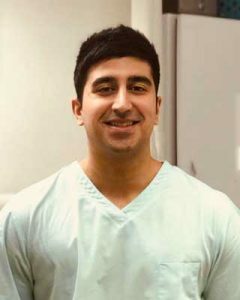 Julian is actively involved in the postgraduate teaching of dentists at the Birmingham Dental Hospital (BDH), Manchester Dental Education Centre (MANDEC), and at the Worcester Royal Hospital. Julian is constantly updating his learning and embraces all techniques, new and old which he feels can optimise the end result of the dentures that he constructs. Julian studied at the Royal College of Surgeons for the Diploma in Clinical Dental Technology in which he gained a distinction. This course developed his knowledge and skills to ensure that he can provide optimum solutions to problems faced by patients in pursuit of quality dentures and technical dentistry. 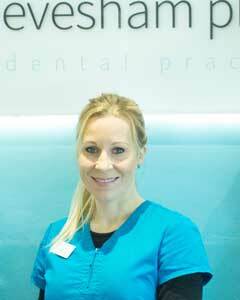 Lisa is a full time qualified dental nurse, she has worked at the practice for 10 years. Outside work she enjoys the gym, walking and time with her family. 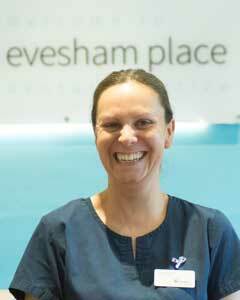 Josie has been a qualified dental nurse for 21 yrs and has worked at Evesham place for the past 8 years. 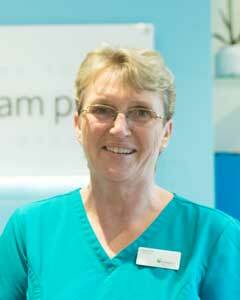 Jo's past experiences as a dental nurse is serving within the Royal Air Force. She has also enjoyed visiting Romania and Africa on voluntary trips and helping the homeless over the Christmas period with a dental team. 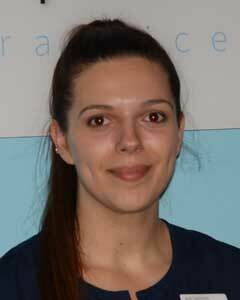 Nicky joined the practice 6 years ago as a trainee dental nurse and qualified in 2012. In her spare time she enjoys artistic hobbies such as glass painting and water colour pictures. Steph has been with the practice since 2008. A warm, dedicated member of the team who goes out of her way to help others. Recently returned from maternity leave after giving birth to her beautiful daughter, Amelia. Mehak joined the practice in 2015 and works full time . She holds city and guilds lever 3 diploma in dental nursing .Outside work Mehak likes practising yoga and socialising with friends and family. 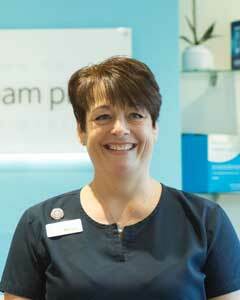 Michelle has been a dental nurse for 16 years and joined the practice in 2010. She has worked part time as is a busy mother to three young children. When Michelle does have spare time time she enjoys creative activities such as baking and decorating cakes. Jessica joined the practice in September 2017, she is currently studying for her dental nursing qualification at Warwickshire College. 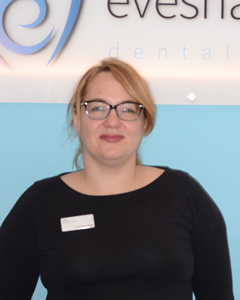 Emma joined the practice in February 2016 as an apprentice and is enjoying the challenge of learning different aspects of the role of a dental nurse every day.